The appointment of Benedict XVI’s personal secretary, Georg Gaenswein, as Prefect of the Pontifical Household fills the last vacant post of the Pontifical family’s organization chart, and at the same time gives more weight and importance within the Sacred Walls to Msgr. Gaenswein. This takes place notwithstanding the fact that he had been strongly criticized for the Vatileaks scandal. On one hand, Gaenswein appeared as a careless or even too naively trustful, since the butler Paolo Gabriele had been copying and leaking reserved documents under his eyes. On the other hand, the Papal secretary paid for his zeal and his filtering of the Papal audiences by having to withstand gossiping against him and personal attacks. Gaenswein even stood up to Josef Clemens – Ratzinger’s previous secretary – and to Ingrid Stampa, a long term Ratzinger’s collaborator. It is not by chance that Ingrid Stampa and Josef Clemens have been named among the Vatilekas instigators, in a sort of gangs’ warfare which has been hardly of benefit to the Pontificate and helped the Vatileaks scandal to grow out of proportion. As Prefect of the Pontifical Household, Gaenswein will be raised to the rank of archbishop. He will be ordained bishop by Benedict XVI, probably during the Epiphany Holy Mass, next January 6th. The Pope will probably ordain other bishops: Angelo Vincenzo Zani, recently appointed Secretary of the Congregation for Catholic Education; and the former Head of Protocol of the Secretariat of State, Msgr. 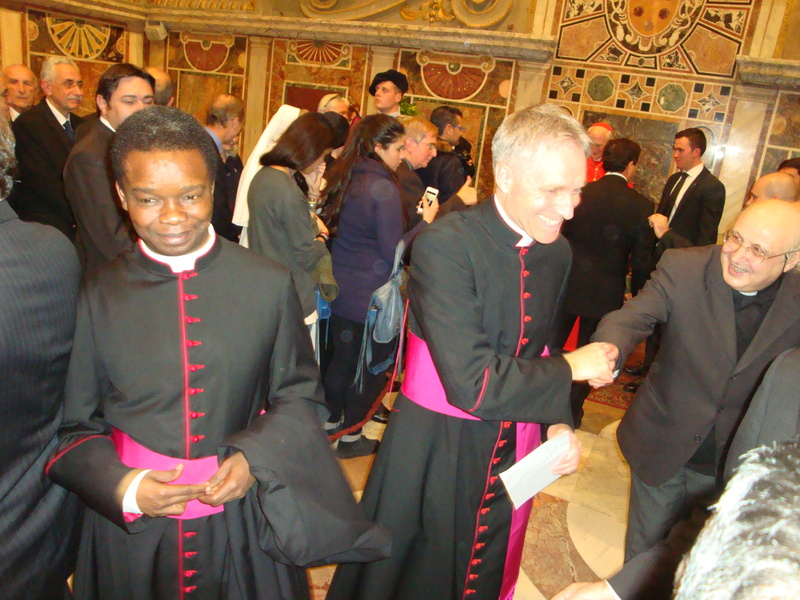 Fortunatus Nwachukwu, appointed new Papal nuncio to Nicaragua. Nwachukwu’s appointment lends food for thought, as many considered it a sort of promoveatur ut amoveatur (promote to remove). In fact, news of the appointment have fed a rumor mill for the past two months. A few days before Nwachukwu’s appointment was made public, the news that Charles J. Scicluna had been appointed auxiliary bishop in La Valletta, Malta, was disclosed. Why was Scicluna sent to his homeland? It was rumored that – in his post of promoter of Justice of the Congregation for the Doctrine of the Faith – Scicluna fooled around with the news leaks on the pedophilia scandal in order to gain favor in the media. But just recently, Scicluna has been named member of the Congregation for the Doctrine of the Faith, which has served to silence those against him. Then, appointments followed one after another. A cascade began with the announcement that James Michael Harvey, Prefect of the Pontifical Household, was to be created cardinal and appointed Archpriest of Saint Paul Outside the Walls Basilica. Harvey would be paying for his role in hiring Paolo Gabriele – in fact, he was not the only one responsible: Gabriele was strongly recommended by Stanislaw Dziwisz, now cardinal and archbishop of Cracow, who had served a whole life as John Paul II’s personal secretary. Obviously, each Papal appointment would be linked to Vatileaks. In fact, any suspicion about Nwachukwu was swept away by a course of action that was as eloquent as only Vatican ceremonials can be. 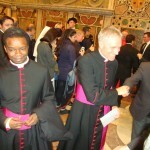 Gaenswein and Nwachukwu are together greeting the new Cardinals in the last consistory. Even rumors on Gaenswein have been now swept away. In fact, Benedict XVI personally chose to make a public statement to defend his closest collaborators – and his remarks are explicitly about his personal Secretary and about Cardinal Tarcisio Bertone, the Vatican Secretary of State. Rumors first spoke about a promoveatur ut amoveatur (promote to remove) for Gaenswein, maybe by appointing him as bishop to a German diocese. Then, it was rumored that his appointment as Prefect of the Pontifical Household would be to separate him from Benedict XVI’s private office. In fact, Gaenswein’s appointment is intended to keep him close by, rather than deploying him elsewhere. Gaenswein now has in his hands the whole machinery of the Prefecture of the Pontifical Household. This allows him to fully concentrate on his activities as Secretary, as he can delegate to Leonardo Sapienza – the Regent who has served for a very long time at the Prefecture of the Pontifical Household – the task of doing “practical” things. A whole new future is open for Gaenswein. Counting with Benedict XVI’s confidence in him, Gaenswein has come out victorious from the Vatileaks scandal, gaining an Episcopal title that gives him authority. Perhaps, the next step is to have him yield greater authority over the Joseph Ratzinger Foundation. At the moment, the president of the Foundation is Msgr. Giuseppe Antonio Scotti: he is a good manager, but he is not considered a “man of culture” – something that the German side of the Foundation had complained about. Gaenswein would be the right man, educated appropriately to promote Benedict XVI’s thought. It is true that a more important and influential role in the Ratzinger Foundation would forever link Gaenswein’s name to that of the current Pope. But isn’t this what people loyal to the Pope want? Simply excellent the way you’ve framed the item!